It's the third week of Advent and we just celebrated Gaudete Sunday. It's the week of joy, my friends! Christ is coming soon! Yet, when we look at the world around us, how can we speak of joy? I'm so very happy that this week is the "week of joy"! We are getting over stomach bugs and colds in this house and what a joy it is to feel so much better! But joy is so much more than just feeling better or being happy. To me joy is a choice, one that we make numerous times a day. 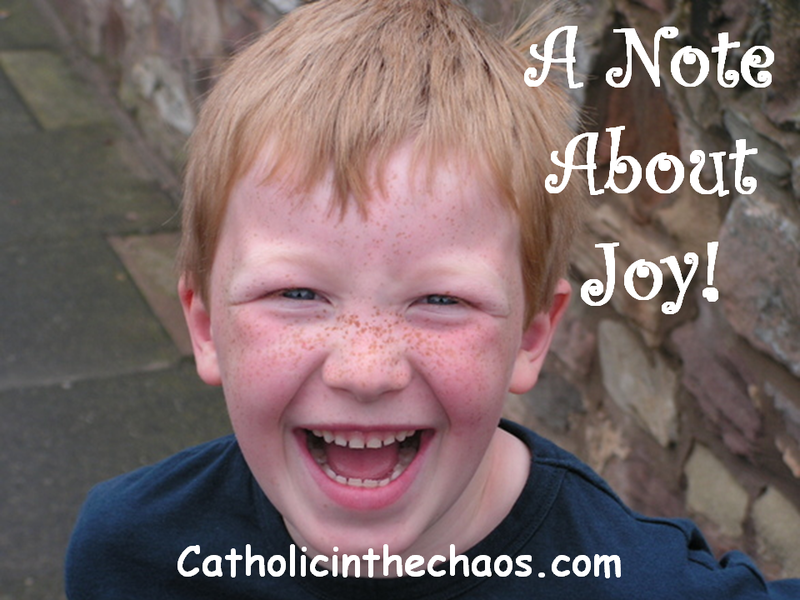 Do we choose to be joyful? When our children wake us up an hour early, do we choose joy? I'll admit it, this is a hard one for me. When it's rainy and cold and we have to run errands, do we choose joy? When it's time to work on reading, writing, or worse...science projects with our little ones, do we choose joy? 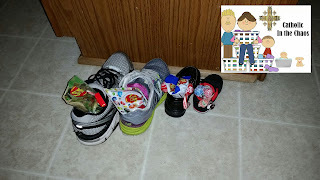 When it's time to make dinner, and our toddler is hanging on our leg screaming (because apparently the only moment that we MUST pay attention to him seems to be the exact moment we must also cook), do we choose joy? Part of being a joyful person is to accept where we are in life and that all situations, trials, celebrations, and the mundane moments of daily life can bring each and every one of us to sanctity. But we must CHOOSE joy! Another aspect of being a joyful person is to SHARE our joy. Like oxygen to a fire, are people to joy. Joy must be shared among others for it to grow and burn strong. So now we need to ask ourselves, do we share our joy? When we get cut off by an oblivious driver, do we share our joy? When we are 10 minutes late to an appointment, do we share our joy? When the post office lost our mail, when the water company puts us on hold for 35 minutes, when our dishwasher breaks, do we share joy? When running in and out of the doctor's office, grocery story, library, do we make that choice to share our joy or do we bottle it up inside smothering it's flame? I know what you are asking yourself. Why should we be joyful, Maria? The world is falling apart? And who can be joyful with all the annoyances of daily life? But I say, why SHOULDN'T we be joyful? The world is a passing phase. Life on this earth, has but one function, to help us achieve Heaven, to be with our Lord, God, the Holy Trinity, forever and ever. And we can use these moments of annoyance, these little sufferings. Even those moments, we can offer up to our Lord. So, really, who doesn't want to celebrate? I mean, we are Catholic, people. We are a religion of festivities and fun. We have two full seasons of celebration, the Christmas and Easter seasons. 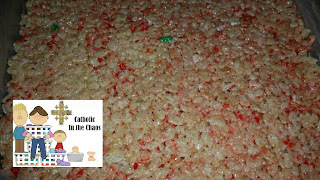 We have so many feast days and saint remembrances, that we are partying almost every day throughout the year! We are a religion of party goers because we know the GOOD news. Christ is coming! So let's choose joy. As my one year old just woke up from a 20 minute nap and is currently screaming for me to come get him, I'm going to have to sign off here, but in the meantime, I'm going to choose joy. May your days be filled with moments of pure joy! 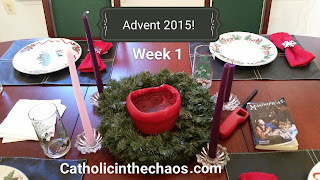 Advent 2015 Week 2: Feast Day Fun! Well we've made it through week two with a little bit of sickness to boot us into week three but at least I'm getting this post up. If you missed our Advent fun in Week 1 just click on the link to hear all about it. 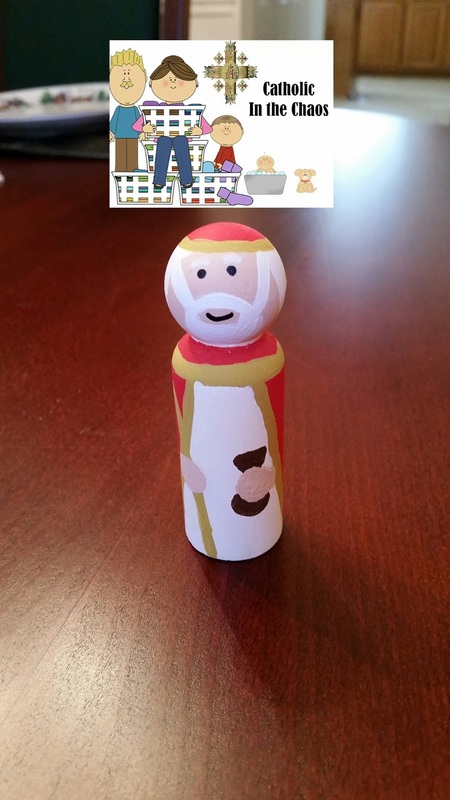 We opened week 2 of Advent with the feast day of Saint Nicholas which is also the feast day of my oldest child. 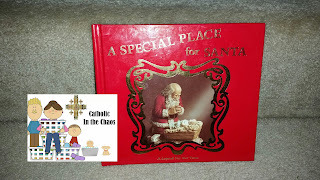 So we spent the day watching a Saint Nicholas movie from CCC of America titled Nicholas: the boy who became Santa, reading about Saint Nicholas and how he fits in this time of celebration of Baby Jesus, and of course enjoying the goodies that Saint Nicholas brought us and our shoes. I also made my son this Saint Nicholas peg doll for his special feast day. 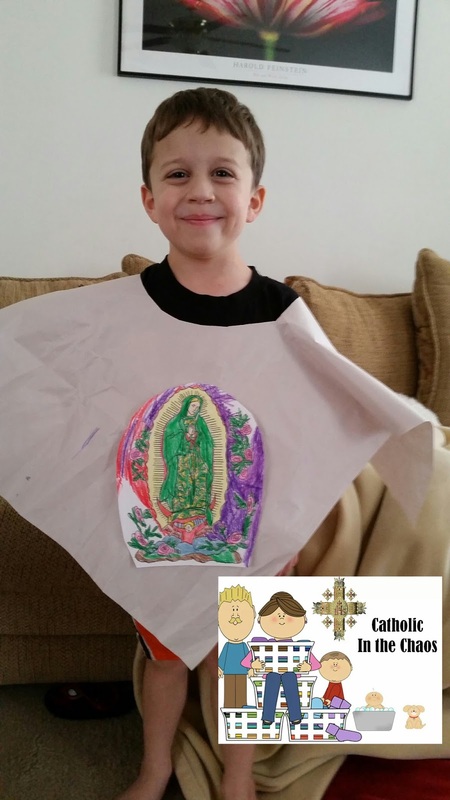 December 8th we celebrated the Immaculate Conception of our Blessed Mother. With this coloring picture from Catholic Icing, I explained to my kids how Mary was born to St. Anne free from original sin. To honor our Blessed Mother, we all wore blue. And we met up with two other Catholic families and colored this picture from Catholic Icing (grab your copy at this link). This is my oldest's "favorite Mary". Ha! So we go big or go home for these feasts! 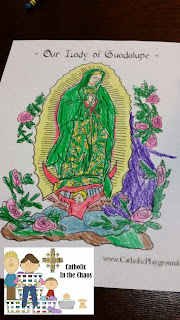 First we watched the CCC of America's San Juan Diego video, followed by coloring an Our Lady of Guadalupe coloring sheet you can get at Catholic Playground (grab it at this link). 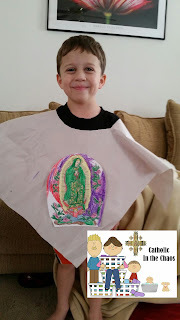 We cut out and taped this picture to some sheets of packing paper (last year we used a brown paper grocery bag) we still had in our house, cut out and whole for the head and voila', we have a tilma for the kids to wear! 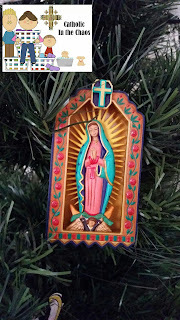 We also have an ornament of Our Lady of Guadalupe my husband found last year on clearance at a Hallmark store. We placed it on our Jesse Tree as a daily reminder of this amazing miracle, that the Immacute Conception was about to bring the Word Incarnate into the world. What a beautiful Advent celebration we have two weeks before Christmas! 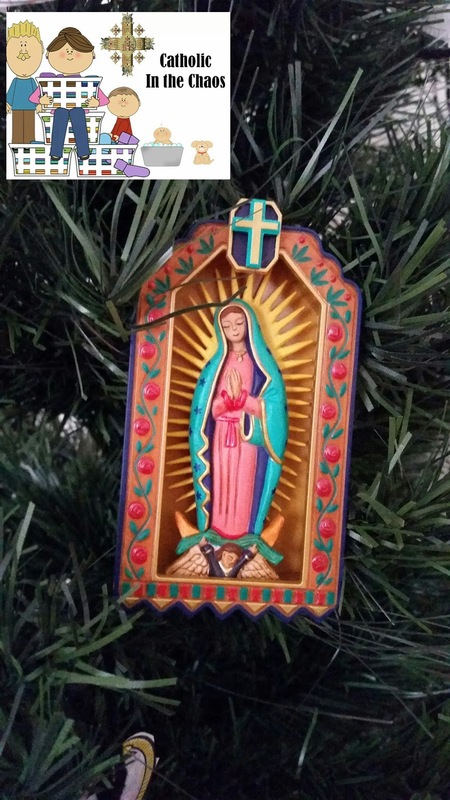 Hanging the ornament in our living area was a great reminder to us all to say a quick prayer random times of day to Our Lady. My oldest is part of a Blue Knights Boy's Club in which my husband, being the good dad he is, is the leader. This week was their monthly meeting and they learned about the virtue "Fear of the Lord", which was a hard one for me as a child to really understand. But my husband explained that just like parents need to sometimes discipline children when they make poor choices, so does our loving Father in Heaven. My husband explained that Our Lord will do everything in His power to keep us close to Him, safe from evil and sometimes those things may feel like punishments but they are permitted out of love for us. As a mother, I totally get "Fear of the Lord" now and pray my children will always fear upsetting or hurting Our Lord enough that it will keep them on a straighter path than I have trod. Here's a picture of the delicious snack I made for the kids. I didn't have any purple sprinkles for Advent, so Christmas colors it was. Our Jesse Tree Ornaments, Advent Calendar and Sacrifice Manger are still going strong here in this house. As you can see from the above picture, my little Bean, loves the tree. Some days we do better than others and sometimes we miss a day and have to catch up on our Jesse Tree ornaments but it's still been so much fun seeing my son internalize more and more of these bible stories I've been reading him over the past few years! 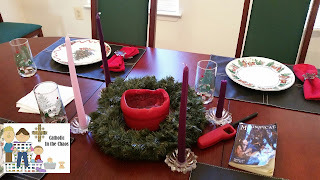 And finally, our family dinners around the Advent wreath have been such a blessing. 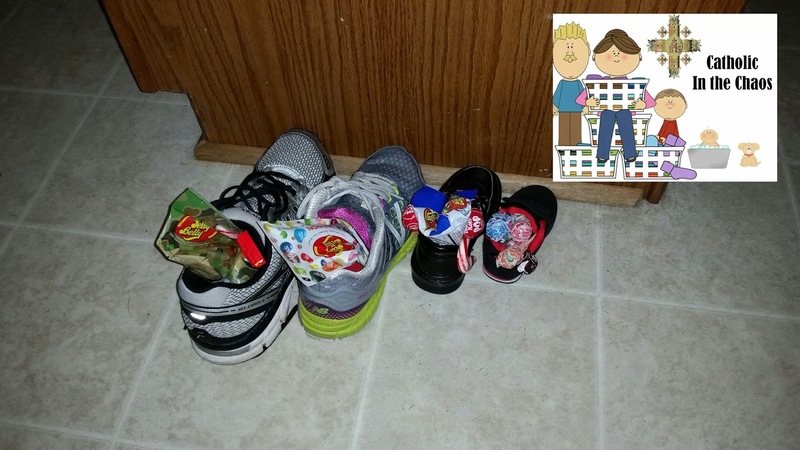 My family is enjoying it so much, it usually is listed as one of our daily "Three Favorite Things" (post coming for more information on this one) for one family member or another each day. 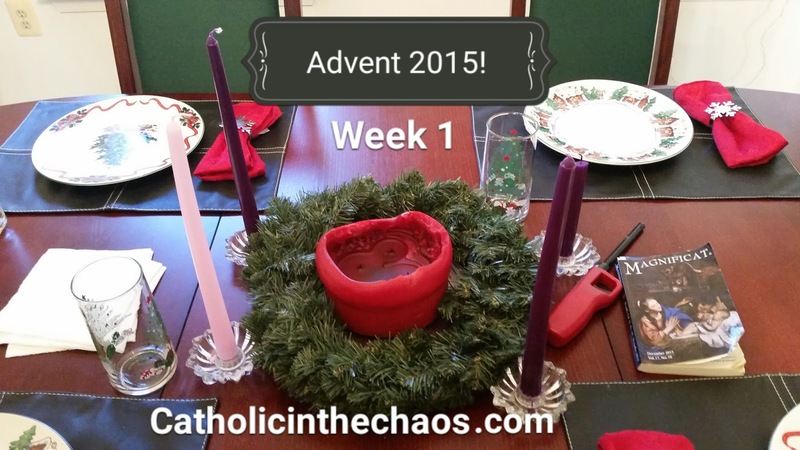 How is your Advent season coming along? Have any other great ideas to share? I'll see you back here next week for our weekly Advent round-up! 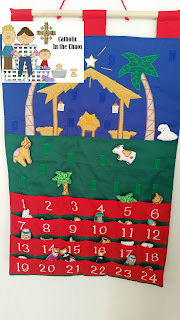 Ok we shall see if 1) I can keep the weekly Advent updates coming and 2) if I can effectively pace myself for all the festivities. Only with God's grace will this happen for sure. I didn't come up with this idea, just liked it and decided to pass it on to my children. 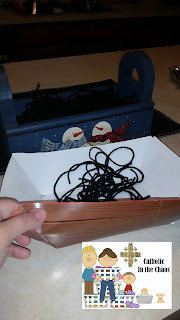 As a way to teach them, Advent is also a time to grow in holiness, we made this little manger out of paper. I used yarn I had in the house for hay, and cut up tons of pieces. 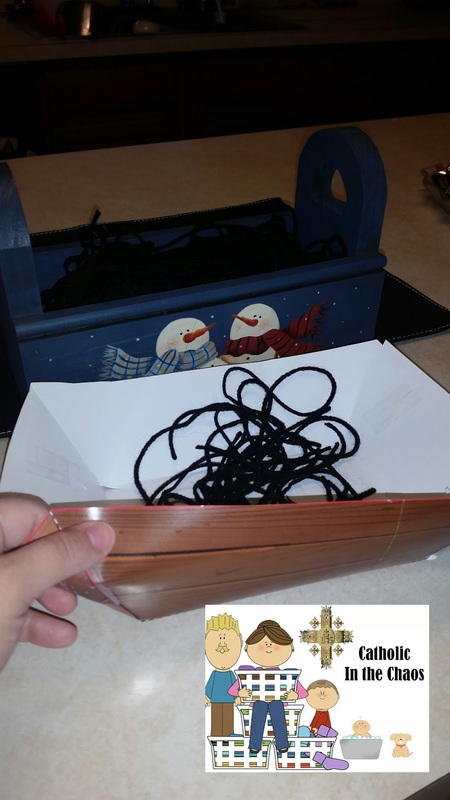 Each time someone in the family does a good deed without being asked, acts kindly to another or loves as Jesus loves, he/she is permitted to add a piece of "hay" to the manger. 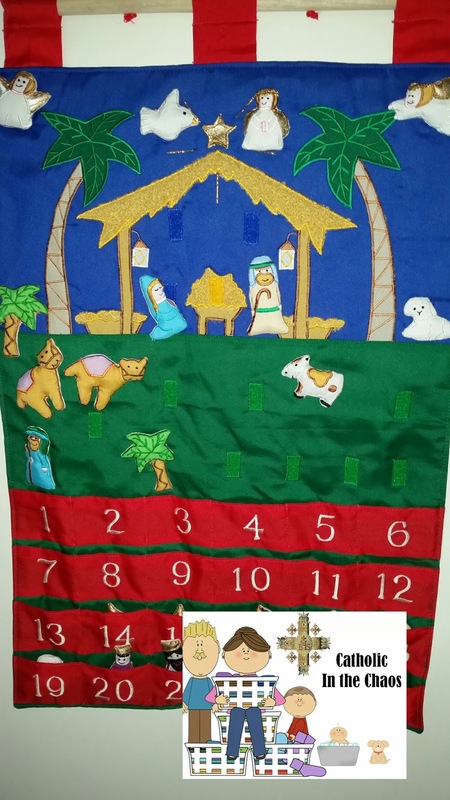 By Christmas day, hopefully the manger will be full of enough soft hay for Baby Jesus' arrival. My 5 year old is REALLY into this one! 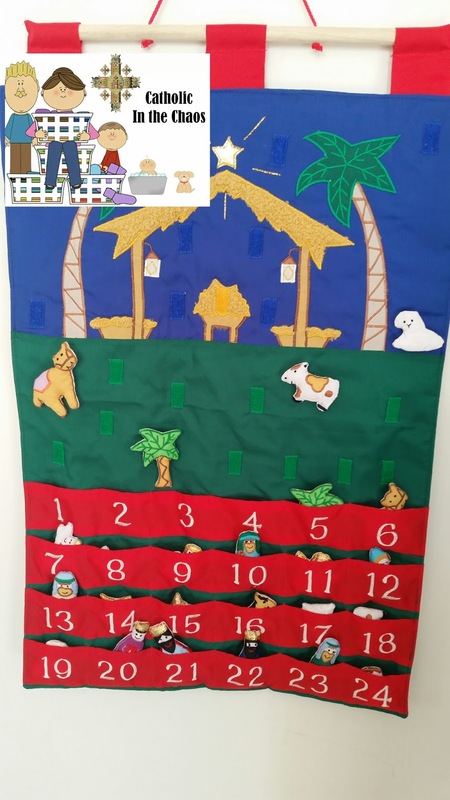 What a great way to learn the history of Jesus from bible stories beginning with Adam and Eve! 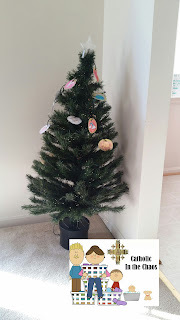 I do not believe in reinventing the wheel so I used a Christmas tree that I had since my college days and put it up in our living room area. I explain to my children that this is the Jesse Tree. 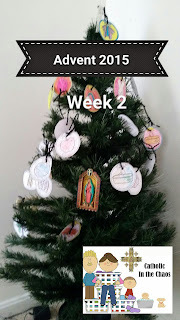 Each day we watch the video from Holy Heroes and color one of the Jesse Tree Ornaments that they provide free of charge from their website. You just need to register for their Advent adventure and you too could have these Jesse Tree Ornaments available to you. Everyday I'm asked "Mom what's the ornament for today?". It's a great way to encourage Bible reading as a family! If you cannot do anything else during the Advent season, sitting down at the table together as a family around the Advent wreath is a must! Each evening for dinner we will sit around the Advent wreath light candles while singing a verse or two of O come, O come Emmanuel and my husband, being the spiritual leader in our family (more on that to come in another post), will read a very short passage from Isaiah regarding the prophecy of the coming of Jesus. Of course my children are still very little so we do have to explain what the passage means. Yet, we feel it's a nice way of introducing the prophecy of Jesus slowly but surely within this Advent season. The wonderful family time and the grace we receive at family dinners is always astounding and I encourage every family if you can do this even once a week to do it, as it's so very important for children. 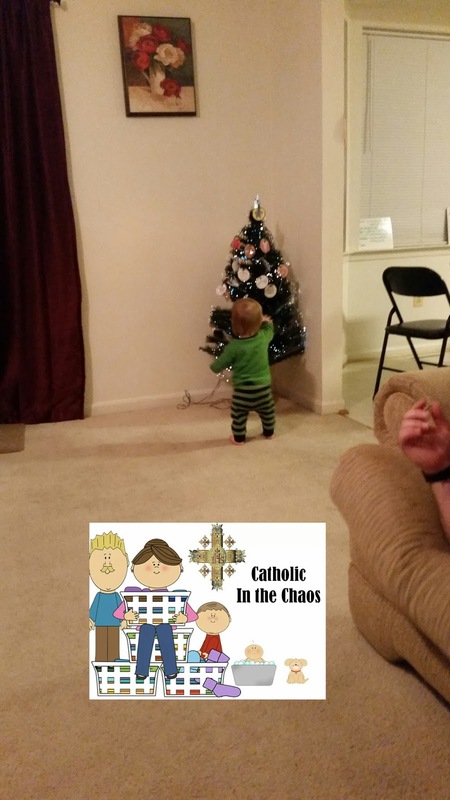 So that's what we have going on during our first week of Advent. Next week hopefully I'll give you an update on what we have been doing for week 2 so stay tuned. Mary: Mediatrix of All Graces! 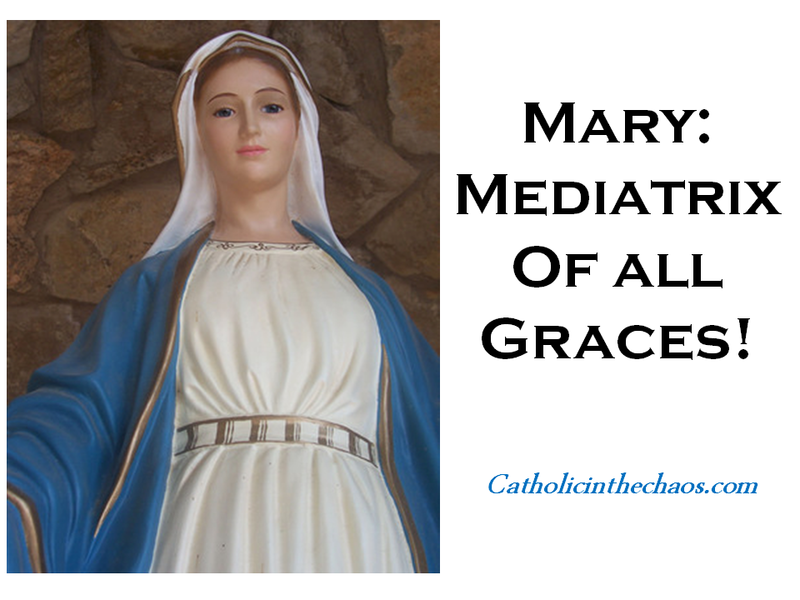 The Catholic Church honors our Blessed Mother with so many beautiful titles including one of my favorites, the Mediatrix of all grace. Now what does that mean? It means that the Holy Spirit, the third person in the Blessed Trinity, chose Mary to bring the Word, our Lord, Jesus Christ, into the world. Did He have to use a woman, who at the time was considered a lesser human being? Of course our God didn't have to use ANYONE to bring Jesus into this world. He CHOSE her. She was chosen, above ALL women! She was chosen for the Son! Upon choosing Mary to be the vessel of the incarnate Word, the Holy Spirit made her, His channel through which all graces flow to this world! Wait. What? Yep you read that correctly. Jesus was brought to this world to complete the "new covenant" through His passion, death and Resurrection. It was ONLY through GRACE that He was made in the flesh and walked on this earth. It was ONLY through GRACE that our Father, God, chose to make a new covenant with us, to open the gates of Heaven. And there was ONLY one vessel in which this grace was bestowed, and that was in our Mother Mary! 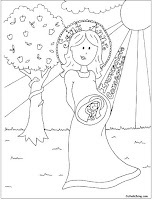 It is recorded in the bible that Mary was "full of grace". This direct translation from the original language actually meant that Mary was, is, has always been since conception, full of grace. The direct translation reveals to us, through scripture that Mary, at the moment of her CONCEPTION was FULL OF GRACE! This is why, we as Catholics, call her the Immaculate Conception and we do not believe our Lady had original sin. Jesus was NOT the Immaculate Conception as the secular world seems to presume. It was, is Our Blessed Mother. This is why we as Catholics know our Lady was the chosen vessel to bring grace upon the world! Sit with this for a minute if this is the first time hearing these thoughts. They are mind-blowing. I understand. Mary was always free from sin. Mary was always full of grace. Mary was chosen by God. Mary, who was given free will to say "No", chose to say "I am the handmaid of the Lord, let it be done to me according to thy Word.". Mary, who brought the Incarnate Word into the world, who raised Him, adored Him, loved Him, taught Him, cradled Him, nursed Him when He was sick, held Him when He was hurt, nourished Him body AND soul (as only a mother can do), then let Him go, allowing Him to sacrifice Himself as a lamb heading to the slaughterhouse. Mary, who watched our Lord suffer under the weight of the cross, witnessed him lose more than half of his blood from soldiers scourging, whipping and beating him, and faced him hanging on the cross for three excruciating hours never choosing to deliver Himself from such great agony. Mary, the mother who lost her Son at Calvary. Mary, the mother whom Jesus loved so much He performed His first miracle only at her insistence. Mary, the mother Jesus adored so fully that He chose to "give" her to the world, by "giving" her to St. John, His beloved apostle at the foot of the cross. THIS is the Mary we venerate! THIS is the Mary we love! ALL graces that are bestowed upon this world MUST come THROUGH our Blessed Mother; given by Christ of course, but ONLY THROUGH the Blessed Mother. She is the channel with which the world receives our Lord! So yes, we as Catholics, rightly so, give our Blessed Mother, the title of Mediatrix of All Graces! It was through her fiat, her "yes", that all graces came, and will forever come into this world. "He has chosen her to be the dispenser of all He possesses, in such sort that she distributes to whom she wills, as she wills and when she wills, all His gifts and graces. The Holy Ghost gives no heavenly gift to men which He does not have pass through her virginal hands." And this is why we LOVE our Mother, Mary so very very much! Through her we learn who Jesus is. Through her, we find HIM!